Once upon a time, our social worker came over for her monthly visit at 8 am on a Monday. Since it made no sense to take the kids to daycare then for a whole 45 minutes before I'd pull them back out for their parent visit, I kept them home in between. We girls were coming off of a rough weekend of hands in mouth, Tylenol and screaming at 5 am. Sister's fussy flailing continued all the way to the CPS office where I sighed with relief when I saw the kids' social worker coming out to the car to help me get them inside. Cue the weekly awkward chaos of getting mom, kids, social worker, diaper bag, etc back to the visit room, where Sister didn't want to be held by anyone but her bones melted when set down, resulting in a puddle of toddler on the floor. I hurried away from the chaos back to my car, ran an errand, parked back in front of CPS and pouted for a good twenty minutes waiting for the social worker to appear at the door for the shuffle back to my car. Then comes the drive to daycare with my arm twisted backwards and my hand jostling Sister's leg, singing a resounding chorus of The Wheels On The Bus, trying to keep her awake because she has to eat lunch at daycare before she can fall asleep. After getting them settled inside and thanking the daycare teachers for their flexibility with us, I sat back down in my car and realized...I'm physically exhausted. And it's only 11:15 am. I headed home to change into work clothes. On the way, Casting Crowns' song Voice of Truth came on the radio. Like sobbing and beating on my steering wheel at the intersection of 39th and Colcord kind of lost it. You see...I know some of y'all say things like "You and Trent are handling this foster care thing with flying colors", etc. And we're doing great. For real, we're really cut out for this and generally rock and roll. But...there are moments when it's really hard. Moments when doubt creeps in. Reminders of how little control we have. Times we feel terribly misunderstood. Days when we're hit square in the chest by this messed up system and situation and can't breathe. So a song comes on talking about the courage to walk on water or slay a giant, and the naysayers that will drag you down and it hits close to home. "Boy, you'll never win! You'll never win!" 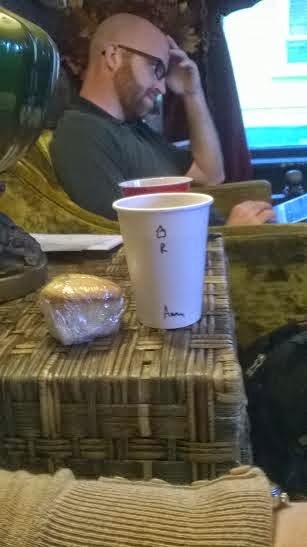 I settled into a booth with a nice sandwich and soda. A couple from our old church came in. I hadn't seen her since Day 2 of the kids being with us, when she brought over a boppy pillow in quick response to a Facebook plea I posted that morning. "You look a lot better now than that day!" As I showed them pictures of the kids on my phone, I agreed and laughed, remembering the absolute wreck I was on February 6th, but wanted to say "You didn't see me thirty minutes ago..." Turns out foster care continues to wreck me. I felt more tears coming but punched them in the face because Jimmy John's was not the place for another breakdown. Instead we chatted about Sister's crazy curls and I gave my appropriately vague update on their CPS case. What does Taylor Swift have to do with all this?????? I made it through the afternoon at work, more or less, and headed back to the daycare to get the kiddos. On the way, Taylor Swift's newish song, Shake It Off, came on the radio. Let me back up and explain that this has been my theme song since I first heard it. It's quite ridiculous really, the connection I make between her lyrics and my life, but let's just roll with it, ok? Just as Casting Crowns' lyrics resonated with me earlier in the day, so did these, with a drastically different effect. Well yes ma'am, Miss Swift, I will indeed get down to your sick beat, complete with top volume singing, bouncing in my seat at red lights, drawing attention to myself, not caring, and yes, more beating on my steering wheel, but this time because I needed a drum, not a punching bag. In various dialogues I have had recently, in which I was describing the many various kid related tasks I have had on my plate lately, one of the responses I got was "You're a supermom", to which I snorted and said "Haha yeah right." But it got me thinking. What did I accomplish to deserve such off-target praise? This part isn't fair to the stay at home moms out there who are actually the real supermoms. Omg, I could not do it, so kudos to you, for real. But in my experience, the supermom compliments stem from the fact that people seem to think that working and having kids is somehow really, really hard. "And you're working full time too?!" Uh...there's this thing called daycare where my kids go while I go to work. It all shakes out. It's somewhat hard to be a supermom without actually having kids, so...yeah. Have some. Or acquire some like I did. The greater the number and the lesser the age, the better. Work deadlines. Doctor appointments. Valentines to send to daycare (because two year olds totally care about such things). Dishes, laundry and cooking to do. Lunches to pack. Notes to write to teachers. Pull money from the bank for the babysitter. Try not to run out of gasoline. Pick up prescription. Email family. Maybe throw in some speech therapy for good measure. Be absent from work for kid related stuff a whole lot. Barely make regular work hours when instead you should be working overtime hours. Scurry around in a hurry, tossing kids into car seats for all the stuff and things you have to do. Turn on the TV way too much for your toddler. Hope people don't come over at an inopportune time and see the wreck that is your house. Bonus points if your car is overdue for an oil change and is four months out of inspection. Better yet, post a facebook status about it. And BAM. 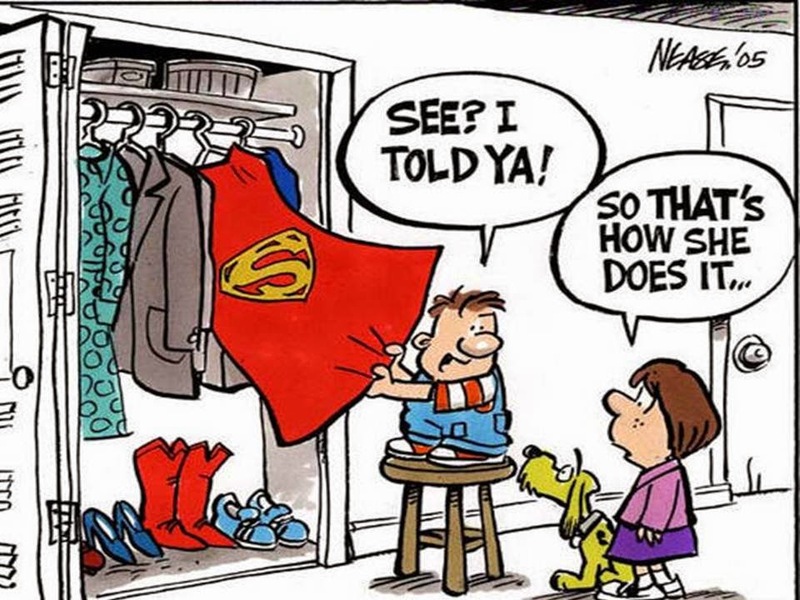 You're officially dubbed a supermom. Let the responses roll in saying how you're doing great, you've totally got this, "I could never do what you do" and, drum roll please, "Oh my gosh, you're supermom." The ultimate. Go ahead and fulfill the obligation to deny, deny, deny and call them all out on the LIES they are telling. Supermom? Haha funny joke. Yeah right. It's all smoke and mirrors and thiiiis close to coming crashing down. And yet people seem to think that your attempts at greatness that result in mediocrity at best are some valiant and wildly successful venture into parenthood. Guffaw. Here's the thing. You are a supermom. Whether you stay at home with your kids or work outside the home. Whether you are sailing through mommyhood with ease or barely hanging on by a thread. Whether your schedule is calm or insane. Whether your employer is understanding or overbearing. Whether your floor is covered with blocks or your shirt is covered with spit up. You are supermom. Say it with me now..."I am supermom." You are. So believe it. And rock on. Ecstatic that tax deadlines are over. Sitting in a comfy chair, at a hipster coffee shop, in my skinny jeans and cardigan, looking at Warby Parker glasses online. WHO AM I?? Hoping my baby girl's teeth don't hurt her too bad today. Wishing I had worn warmer shoes than sandals because Fall is apparently here. At least for this morning, since the high is 88. Good ole Texas. Don't ever stop giving hugs. They are the best and you are so good at them. You give the melty kind with arms flopped and head resting on our shoulder, smothering us with joy and trusting us with your little heart. Don't ever stop saying I love you, or "Ah luh ye" as is the norm now. I swear you say this like...fifteen bajillion times a day...including hollering it through the dark and the closed door right after we leave your room at night. Sometimes it's the first thing we hear from your room in the morning. When you grow up, you might think it's not manly to say I love you fifteen bajillion times a day or holler it through a closed door but, it's one of the best things a man can do. Don't ever stop dancing. Because your dancing is absolutely rad, dude. Sometimes you look like you're doing the robot, sometimes you look like you're doing my former youth minister's old man dance, sometimes you are rockin' out and fist pumping in your car seat, complete with head banging. Dance through life, sweet boy. Don't ever stop asking questions. I love to watch your curious mind look at things and I don't tire of you asking "wha dat? ", also about fifteen bajillion times a day. If you want to know something, always ask. We will be here to provide as many answers as we can for as long as we can. Don't ever stop asking for help. It's always better to stretch out your hand at the top of a steep stair and say "Hup, mama, hup" than to bite off more than you can chew and end up face planting on the cement and chipping your teeth (oh wait, you did that the other day). Don't be afraid to ask for help. It's not a sign of weakness. It's a sign of knowing what you need in order to succeed. I am more than happy to take that sweet hand of yours and guide you. Don't ever stop being peaceful. Ok, let's face it. Your sister can be a little bully sometimes. But when she's pulling on your hair or bothering you, I'm so proud of you for not retaliating. You could hit her. You could fight back. But you don't. You get mad, but you just tell her "No, no" and holler for me to come rescue you. Keep that peaceful response, for the world could use a few more peacemakers. I marvel daily at your sweet little soul and can't believe we have been so blessed to have you in our life. Anyone. Your neighbor, your mom, your version of our "Mama Judy". Especially if you have a placement on the way that is multiple children, the more adults the better. There will be paperwork to sign, stuff to figure out, info to soak up from the social worker and, oh yeah, shocked children hanging around as well to tend to, the infant version of which might not allow you to put them down. Then there will be the inevitable trip to Target or Walmart made by one spouse, leaving the other home alone with children they know nothing about and are not yet adequately set up to care for. Do not overwhelm your home or the children with many people, but at least have one other human being come over to help. If they're old enough to understand what's going on, give an actual house tour of the entire house (and yard perhaps, if it's not dark and 20 degrees outside like when our kids showed up). If they're little, allow them to just explore. Brother toodled around our home with Trent right behind him for a while after they arrived. He was looking around and saying "mama?" We let him get a feel for the place and look all he wanted. You may not know how your pets will do around children and you sure don't know how the children coming to your home will do around your pets. Put pets in a closed room or outside when the children are arriving and allow them to meet a bit later when you can focus on the moment, control your pet and reassure the child. You don't know what that first night will have in store. For us, it was throw up at 3 am, which sent us scrambling in the dark for more crib sheets and pajamas, neither of which we were even sure we had. Our kids arrived with a couple trash bags of clothes and toys, all of which were damp and musty. Your kids' stuff may appear to be fine, but can't hurt to go ahead and run it through the washer for a fresh start. Note that if there was anything significantly dangerous going on, like a meth lab in the home that would have soaked into the clothes, CPS and the police would not have let the child bring anything with them from that home. Somehow separate or note what toys or clothes they came with, vs other items you already had, are given, or buy. If the child goes home, you don't want to have packed away their first Christmas dress or given a special toy to Goodwill. Unless you've been at this for years and have plastic boxes nicely labeled of all ages of kid clothing and supplies, you're going to have a scramble at first. Our home was in complete chaos for days as we tried to figure out what we had, where it was, what we needed and when we could go get it. This was basically impossible to accomplish while the kids were at home. The only way to gain some control was to go home while they were still at daycare and take care of things. Take time to get set up well and things will go a whole lot smoother from there. At about 8 am on our first morning with the kids, I posted a Facebook status asking if we could borrow a few specific things. All of them had showed up at our house within two hours. That continued. We kept putting feelers out for specific things we needed and they just kept showing up. It was awesome. On the other hand, some people seemed to think "New foster parents! They must have nothing! I'll send them my entire stash that I've been meaning to take to Goodwill!" I remember standing in our living room with Mama Judy looking through piles of things that people had brought to her for us. I was so overwhelmed. She told me "You tell me yes or no. If you don't need it, you don't need it sitting around." So we did just that. Yes, no, that's broken, yes, I don't even know what that is, yes, no, no, that's for a newborn, we don't have a newborn... Then she packed all the No items back in her minivan and I never saw them again. We still ended up with piles of stuff in our den that came straight to us without the Judy filter that sat and sat and finally my sister took most of it to Goodwill a couple months later. So that's a tip for people wanting to help new foster parents: ask what they need and allow them to say no.